The Sudanese army has said it will make an “important statement” on Thursday, April 11, amid mounting evidence that it was orchestrating the ousting of President Omar al-Bashir after 30 years in power, The Guardian reports. State media offered no further details, but government sources told Reuters that Bashir had stepped down. Adel Mahjoub Hussein, the minister of production and economic resources, told the Dubai-based al-Hadath TV that consultations were under way to set up a transitional council to run the country. 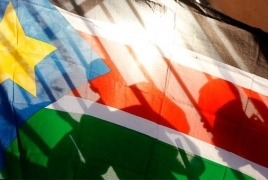 The news of an announcement from the army came as analysts warned that Sudan could descend into anarchy if its political crisis is not resolved peacefully and rival factions within the security establishment fight for power. The country, one of Africa’s biggest and most strategically important, has been paralysed by months of protests against Bashir’s 30-year rule. There were reports that was under house arrest with a number of aides at the presidential palace. Since Saturday, thousands of people have camped a crossroads in the centre of Khartoum, calling for Bashir to step down. Attempts by security forces to break up the demonstration have killed at least 22 – including five soldiers, who organisers said were defending the protesters – and injured more than 150.